God created the human brain so perfect and so complex, that scientists admit that they cannot comprehend more than about 8% of all brain functions. Our "thinking system" is actually our mind. For the fallen man to get back to where God created him to be, he needs to renounce his ungodly ways, take Jesus as the true Lord of his life, asking forgiveness for all the sins he committed thus becoming born-again by the Holy Spirit (More can be read about it here: Salvation). The promises of the Bible are valid and functional in the lives of those who are God's children, adopted by the sacrifice of Jesus Christ and living in obedience to God. This article aims to reveal what the Scripture says and what science has discovered, in the matter of the human brain and its activity. This is not a scientific dissertation, but in listening to Dr. Caroline Leaf, a Christian neurologist who has studied the brain and its thought processes and functions, for over three decades, I came to the conclusion that it is important for this information to reach as many Christians as possible and also to be conveyed as simply as possible. The conscious mind is the part of the brain activity of which we are aware of. It is only 5 to 10% of of all brain activity and the rest is called the subconscious mind. That means that the Lord, in His wisdom, has allowed man to have control over only a small portion of his own brain. God created man in His image and according to His likeness (Genesis 1:26) to live in love and think right, clean and beneficial thoughts. When a person recognizes God's love, accepts it, loves God in return and loves others, then there is the potential for all organs to function perfectly, at optimal parameters. By living in harmony with our Creator, we relate with positive feelings to the world around us. Positive thinking is actually the result of the fruit of the Spirit manifested in our lives. All positive thoughts are materialized by creating healthy, vigorous proteins called dendrites that store the thoughts that formed them, and they become temporary memory. This memory will become permanent if we continue to rethink the same thought, long enough. The same process happens with the negative, toxic thoughts. The difference is that the memory created by these thoughts are damaging the brain and then the whole body. We think with extraordinary speed, both consciously and subconsciously as the brain normally functions with over 400 billion thought functions per second. When we choose negative, toxic thoughts, monopolized by fear, anxiety, frustration, anger, sadness, malice, violence and anything else that is the opposite of the fruit of the Holy Spirit, our brain produces deformed dysfunctional proteins, which can lead to the degradation of the whole body. Science has proven that there is no circuit in the human brain created for fear and the results of it. We are born to love but we learn to fear. For example, a small child is not afraid of getting burned by touching a hot stove, until he gets burned for the first time. Galatians 5:19-21 "Now the practices of the sinful nature are clearly evident: they are sexual immorality, impurity, sensuality (total irresponsibility, lack of self-control), idolatry, sorcery, hostility, strife, jealousy, fits of anger, disputes, dissensions, factions [that promote heresies, envy, drunkenness, riotous behavior, and other things like these. I warn you beforehand, just as I did previously, that those who practice such things will not inherit the kingdom of God." It is essential for us to understand and accept that God created us perfect, but by the wrong decisions and choices of mankind, we have departed from what God intended for us. The good news is that we are neuron-plasticious, meaning that we can modify our own brain, if we learn to think correctly, as God created us to do. We communicate with God through prayer. We are called and created to pray uninterrupted. Through prayer we are connected with the Holy Spirit and we ask the Lord for direction and in reply, He leads and guides us. Only then, we can make good decisions, think in biblical ways, allowing our minds to heal our brain and we stay daily in the presence of the Lord. The world of science has proven over and over, that man is created to communicate non-stop with his "source" (The Creator); even if their studies do not admit the whole truth, we know that the source is God. Paul urges us to pray without ceasing, at all times, persistently and without discrimination! He also urges us to do something very important - to live in a state of joy. Joy and prayer are very good friends. We can find the true joy; the sincere, full and lasting joy that only comes through the Holy Spirit when we enter into the presence of God. And we cannot enter into the presence of God without prayer and worship. Sincere, persistent prayer that praises the Lord and gives thanks for all that He is and has done in our lives, brings us into God's presence. The term for a sound mind, in the original Greek language is: "sóphronismos" and it means self-discipline, self-control, prudence, issuing in prudent ("sensible") behavior that "fits" a situation (NAS Exhaustive Concordance). God created us to be strong, loving and with self-discipline. The Lord did not give us a spirit of fear. He did not create us to live in fear and/or without self-discipline. Moderation, temperance, self-control are possible through the power of the Holy Spirit whom God placed in us when we invited Jesus Christ to be the Lord of our lives. The transformation of the mind is not a single event, in fact, it's a long term process. It takes desire and determination to form a healthy way of thinking. This will begin to restore the brain. The nervous cells that were damaged by our toxic thoughts, will be replaced with healthy ones, formed by our good thoughts. All our thoughts, decisions and brain actions are forming the mind. Science has proven that the mind can regenerate the damaged brain cells. But the real restoration is produced only with the help of the Holy Spirit. Without His guidance, we can not think as God wants, and we can not really change. Studies show that we need three cycles of 21 days, 63 days in total, to change and replace a bad habit or a toxic mindset on a particular problem with something good. With 7 minutes of prayer daily on a given matter for 63 days it, is enough to change it. This process replaces the damaged neurons with healthy ones and also restores our DNA. The restoration will absolutely start to recover the immune system and improve the health of the whole person. We need to ask the Holy Spirit to show us what we must change and to help us do it. Then we need to pray faithfully every day, proclaiming the Bible verses that support the solving of our problem. In this way, we will be able to restore our brain, renew our minds and become more and more like Jesus. When we were children, we learned through repetition. The skills and habits we learned were put into our subconscious mind and now we perform them automatically. In this manner, the subconscious directs our actions without the need to focus on them. Do you ever find yourself wondering if you brushed your teeth, because you did it so automatically, that you are not even sure of whether you really did or not? Our senses (eyes, nose, ears, mouth and skin) perceive various stimulating factors in the environment and turn them into nervous impulses. These impulses propagate through the nerves to the central nervous system, represented by the brain and spinal cord. The information is stored in our subconscious, as dendrites, the proteins that grow on the nerve cells. During the night, the brain processes the information received during the day, and all the thoughts that crossed through our mind. That is why it is so important to guard what we see and hear, what we talk about and how we behave, and with whom we choose to spend time, etc. Nothing passes by without leaving a trace, good or bad. If the information we received is processed in a healthy and positive manner, that is repeated long enough, becomes dendrites that will continue to develop and grow. They will become the healthy part of our way of thinking and will contribute to the renewal of our mind. If the information we received is processed in a negative and toxic manner, it produces proteins in excess, which leads to the destruction of the involved neurons. This in turn, causes an increase in the level of toxins throughout the whole body and in time will lead to physical illness. Toxic thinking is the common denominator of all mental illnesses, and also the root cause of most disease. Unfortunately we not only store the good and beneficial thoughts in our subconscious; but we store it all. All data is stored including the things that hurt, scared or offended us, and when repeated in our mind, was transformed into a trauma. There is a difference between sin and trauma: Sin is committed voluntary, while trauma is involuntary. Traumas are more complicated. When we regret and repent of our sins, we ask forgiveness and pray to the Lord to help us not to repeat the; but traumas are more difficult. We find traumas in the Bible as "strongholds." For each and all of us, the truth about an issue is relative and a direct result of how we interpreted something as truth at some point. Therefore the study of Scripture is of dire importance, because only there we find the absolute truth! Jesus Christ is "the Way, the Truth and the Life" (John 14: 6). He is the only way to the Father, He is the Word and we will live forever only through Him. God placed in us the spirit of life. We find eternal life in heaven, only in Jesus. Apart from Jesus is eternal damnation, eternal torment. Man chooses where he wants to spend eternity, before he takes his last breath in his earthly body. It is not enough to only "hear" the biblical truth, about our issue, to become free. Jesus said: "to those Jews who believed Him, “If you abide in My word, you are My disciples indeed. And you shall know the truth, and the truth shall make you free”" (John 8:31-32). The first step is abiding in the Word, and by studying daily to see what the Scripture has to say about our problem. Then we need to repeat those verses, at least seven minutes per day, as well as through out the rest of the day. As we do this, we also ask the Holy Spirit to reveal to us the truth of those verses. The Scripture that is revealed by the Holy Spirit becomes "living and powerful, and sharper than any two-edged sword " (Hebrew 4:12). This is the Word that cuts and removes traumas, prejudice, false beliefs and all the toxic strongholds that we allowed by our own carnal nature and let our spiritual enemy influence our minds with. By turning it around with God's Word, prayer and serious positive thinking, our nerve cells will regenerate and we will have a real and long lasting freedom. So what weapons do we have? Paul makes it clear that our weapons are not human. God has provided our weapons, and He made them mighty "for pulling down strongholds." Then, Paul tells us that the strongholds are actually conceived in our mind and there we also find thoughts that "exalts themselves against the knowledge of God." The weapons are prayer, praise and worship, proclamation of Scripture, and self- control of what we think about. We have to be willing to recognize what kind of thoughts cross through our mind and to bring them to obedience to the Lord. How do we do that? We must refuse to think thoughts that bring doubt or induce fear, terror, malice, hatred and all that comes from the carnal nature. Then, we replace those thoughts with what the Bible says in in regard to our situations and we praise the Lord instead of complaining or grumbling. I remember that, at the beginning of my walk with Christ, I repeated these 2 verses, until the evil thoughts I was having and the spirit of doubt got bored and fled. Every victory filled me with happiness and strengthened my faith and love for Jesus. Needless to say, the victories were coming faster and faster. Also my joy was growing and lasting longer, as my mind was getting renewed and the Word of God became more and more an integral part of me. The freedom that comes from knowing the Word of God and from being increasingly filled with the Holy Spirit, is worth every effort. Jesus came to make us free. The only addiction that brings freedom is the total dependency on God. The more we depend upon Him, the more we realize that we cannot achieve anything by ourselves and that all we have is from Him. It's a feeling of infinite peace, to know that you can leave everything in our Lord's hand and He cares for all, in the best way possible. Let us not forget something very important. We are not bound to the spiritual heritage that we received through our biological parents. We are not bound by their generational sins or mistakes. Finally, science has caught up with the Bible, in admitting that toxic thinking is changing our DNA. These changes are transmitted to the child to the fourth generation. In the Old Testament we read many times that God punishes sin unto the fourth generation. But the Lord in His love and mercy, God makes these generational sins (addictions, curses, etc.) to be passed in a dormant state. Man chooses to activate or to annihilate them, by his lifestyle and the way he thinks. With the help of the Holy Spirit and by hiding the Word in our heart to not sin against the Lord (As the Psalmist says in Psalms 119:11), we can destroy the strongholds and regenerate our DNA. Even Paul wrote about what man falsely calls knowledge. The situation is the same today. True science confirms and explains the wonders of God's creation. Manipulated science, distorts the truth so it will please the majority, chiefly those who deny the true and living God, the Creator of the entire universe. We all have the same structure of the brain, the same kinds of neurotransmitters and the same kinds of circuits, but every human being is unique. God created billions of people and each with their own distinct personalities and thought processes, unique to the character of each individual. This magnificent and Almighty God deserves our worship and obedience. God invented the law of bio-diversity, not man. Therefore, it is of the utmost importance that everyone be who God created us each to be. We need to stop trying to change those around us to become our clones. And at the same time, we should not try to emulate those that we admire. We excel and will only be fulfilled by being who God created us to be and fulfilling His plan for our lives. As Dr. Leaf says, "you make a lousy somebody else - just be the you that you are meant to be"
We cannot control the circumstances or what other people do against us, but we can control our reaction. When we react wrong, complaining and whining, that produce toxic thoughts that adversely affect our entire body. When we listen to the devil's lies and we agree with him, we actually create evil in our own mind. When Jesus defeated Satan and rose from the dead, the Lord tells us that He was given "all power in heaven and on earth" (Matthew 28:18). So how much power does the devil have? Only as much as we give him, by believing his lies and forgetting what belongs to us. We react properly, when we ponder the problems from God's perspective,and we trust Him. That will cause all the bad to change into something good for us, we will enter into His love and we'll give God the freedom to intervene for our benefit. God changed Joseph's tragedy of being sold into slavery by his brothers, into using Joseph to save his people from starvation. While the devil thought that he would destroy Joseph, God took care of him the entire time. The Lord used every negative circumstance from Joseph's life to get him closer to the highest position possible. Only Pharaoh, by birth right, was above him in the hierarchy. Such is the power of our God! So what saves us? What can heal our brain and reset the way we think? What can set us free? Where can we find all the instructions we need to live to please God? What is the most powerful weapon available? Yes, the answer is the Word of God! For the Scripture to work in our lives we have to live accordingly to its directions. If we have the Word planted only in our minds and we use it just to seem smart and educated, we are only deceiving ourselves. In fact we have nothing. Only the word that is alive in us and leads us to be obedient to God. 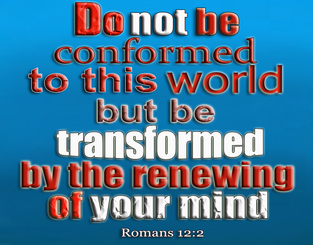 The living word is transforms us by renewing our minds and that is the word that saves our souls. If we live accordingly to the above verses, we are truly free, our are hearts full of peace and our faith will be strong enough to move the mountains. If we meditate and think about all that is love, goodness, holiness, goodness, we remain in our Heavenly Father's presence, "who is able to keep you from stumbling, And to present you faultless” (Jude 1:24). The choice is up to us. The life we have now is the direct result of our past choices of how we chose to be obedient to God (or not). Every day is a new day and the Lord's mercies are fresh for us. We can choose to have a firm faith that keeps us strong on God's path for us. We can choose to pray continually, because we were created to communicate all the time with our Lord in prayer. We can choose to do away with toxic thinking and replace it with godly thinking and truly see the renewing of our minds and its replenishing effects in our lives. We can take the pressures of this world, past and present, and filter them through the Word of God. We can do all things through Christ who strengthens us (Philippians 4:13)! The renewal of the mind is essential to understand and become what God wants us to be and to live to please Him. Living with Jesus is the only life that has real meaning and eternal significance. Thank you Lord Jesus for your sacrifice, that You have opened the way to heaven for us!